Rating: 4.6/5 based on 41 review(s). 1586 people have bought this item! 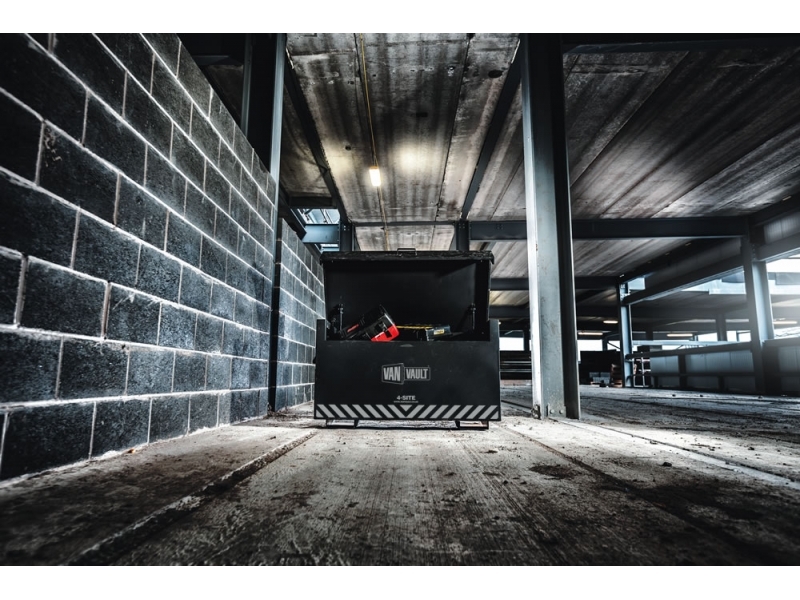 Vanvault 4 Sitebox is designed for use on site locations rather than in vehicles, the Van Vault 4-Site is virtually impenetrable thanks to its 2mm sheet steel construction and two 5-lever BS locks. Delivered on time and as requested. The Vault itself is great and lighter than most. Spoke to a friendly voice on the phone, they guided me to and though the mail order page. Very helpful. We made arrangements for an a.m. delivery next day. Was just right having a brew and some toast following morning, the front door bell rang, opened it, there was a very obliging driver with my Van Vault on his truck. Asking where i needed it, we placed it in my van, perfect. My opinion good site to use, good people to talk to, and good delivery service. THANK YOU. Will be ordering again soon. Very pleased with my van vault, the speed in which it was sent and the young ladie on the end of the phone. Thank you very much. Great product as described, delivered direct to site as requested and on time. Great service, great product and prompt delivery! What more can you ask for?! Bought quite a few of these now....always excellent service. Great service from Sitebox but let down by delivery company Ordered second Van Vault Box for delivery in two days time, however no delivery, contacted Sitebox who contacted transport company and called me back, it appears the transport company had some IT promblems and that the box would be delivered next day, it has not. As it is now the weekend I hope the Van Vault will arrive on Monday 3 days late. Nothing but praise for Sitebox however their delivery company needs to do some explaining. found the van vault cheaper than anywhere else, ordered late a.m, arrived am the next day! couldn't ask for better service than that! Pretty poorly built compared to my Tuffbank tb2. I don't really trust putting tools in it so just use it for PPE & fixings! Good price, product and delivered as per order. Easy transaction, would recommend these guys. 4 Site security box Ordered, payed, delivered, very easy transaction. Thank you !! A very good box for the price (van/sitebox 4) . I would have given 5 stars, but I phoned on a Friday to get it delivered on the following Friday, only to have a very ignorant women from tnt phone me on Monday morning complaining about me not being in to receive my parcel. I ordered this box with casters to be delivered on a Friday. The box was delivered on a Thursday, with no wheels. The wheels turned up the following Tuesday after I chased them up on the Monday. The key lock then disengaged. I phoned the company up, they instructed me to break in and get my tools and they will replace the box - but not the wheels. It took 2 of us about 3 hours to break in to it, using whatever we could, as our tools were inside. This box is very well constructed, but the keys seem very very cheap. Yes, I would bye from them again, but they really do need to work on a better key mechanism. I have ordered one of their van vaults size 1195x700x695 Friday evening to be delivered on site and got the item delivered by Monday afternoon. Although I was aware of the size I wasn't fully aware of the box heavy weight which is 65kg, it took a bit of effort in two to place it in position but once is loaded with tools and bolted to the floor you can sleep at night knowing your tools are safe. Overall a very happy customer. Firstly Sitebox service is A1 This box like other van vault products is in my view excellent value I purchased 100mm castors and 8mm bolts separately from scr--f-x The unique metal ID badge riveted on the side is a nice touch. Great site box, great price and speedy delivery, many thanks! Ordered the van vault 4 and it arrived within 48 hours as stated which beat competitors lead times of 1 week upwards. The van vault was also competitively priced. Excellent customer service. Van Vault Site box Good quality, secure product, well priced and delivered on time. I will use Sitebox again. Got thrown off site because the gas struts don't stop the lid from falling! Apparently this is what they're all like. Looks good but that's about it. Don't recommend - bought Tuffbank instead. This product would of been 5 stars if i didn't have to cut out for other lock work. Obviously both locks were not tested before it was sent out which was a disappointment. Also to send 1 person to deliver it is just plain stupidity. My wife was in with my 2 toddlers while I was at work and has to call somebody to give the man a lift. I would highly recommend using sitebox ltd. website was easy to use, no hassle. I received my site box the next day delivered to my door. I will definitely be using them in the future. Delivered as promised and agreed. Also, one of the few "Customer Service Agents" I have EVER spoken to, who listened and took the time to ring back and explain what was happening and got it sorted. Thank you Sonia !!! We have received exactly what we needed, however the customer service especially regarding the delivery could be improved. I like the vanvault 4 site its very nice and I think the whole box is as decribed on the website,. Friendly team. Quick delivery[ next day]. Very smart driver [delivery]. Happy 100%. Many thanks. One of the best prices around, and having used Sitebox before trusted them to deliver 2 of these to us next day which they did!! TradeSafe TS 4 x 2 x 2 Extra Site Box with Hydraul . . .